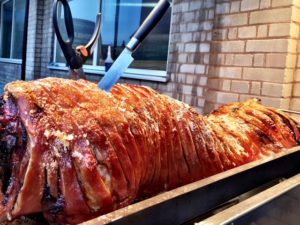 Once you hire Hog Roast Worthing to cater your event you will never look back. Our expert team of event planners, waiting staff and of course chefs will work tirelessly to ensure your day goes perfectly according to plan and will always go above and beyond to cater for you and your guests. This Sunday we had the pleasure of catering for baby Elizabeth’s christening. Proud parents Owen and Abby had been planning the christening for a few weeks now and had contacted us after sampling our slow roasted food at a friend’s birthday celebrations. Owen told us he couldn’t imagine a better team than Hog Roast Worthing to come and supply the food for their daughter’s christening, what a compliment! As per usual we arrived bright and early so that we would have plenty of time to get the hog slowly roasting away ready for after the ceremony. Abby and Owen had chosen our classic Hog Roast Worthing sandwiches as the centrepiece for the lunch and had asked us to serve the christening cake up afterwards. Elizabeth’s grandmother, who baby Elizabeth had been named after, had worked on the cake herself and you really could see all of the hard work and love that she had put into creating it. With hand finished royal icing flowers and bouquets, it would be a shame to have to cut it up for serving.